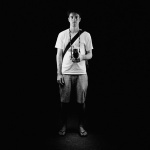 Review by Dan Abbe for Japan Exposures. Having only recalled a bit of my friend’s description — something about family — I didn’t really know what to expect. Walking in to the room I saw about 15 or 20 large color prints, with no clear visual order. I remember thinking to myself: “what am I looking at?” Even looking at the first print, I couldn’t process the image properly. Why was it so big? Who were those people? Why were they in a ramen shop? Who takes a large format camera to a ramen shop anyway? And why was the woman in the corner giving the camera such a strange, knowing smile? It seems to me that the intent of using these activities is not to comment on contemporary Japanese culture, as they’re never scrutinized in any serious way. Rather, they are a medium through which Asada can heighten the feeling of his portraits. 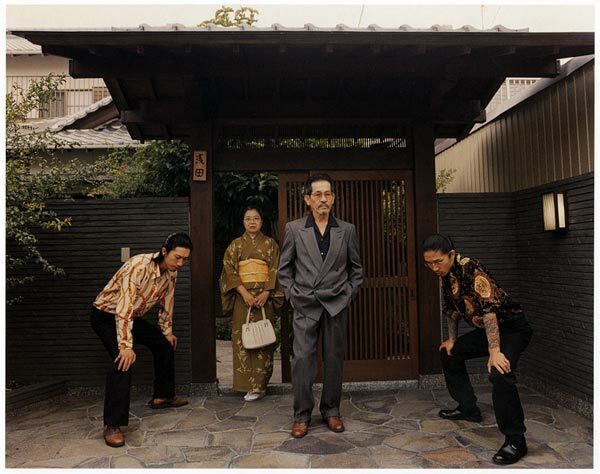 Using these artificial situations brings out the personalities of the members of his family, and also creates a relationship between the work and its audience. To create these portraits, Asada had to put his family into some fairly strange situations. For example, how often do you pretend to be on the set of a fashion shoot with your family? The obvious relish with which Asada’s parents (an older couple) tear into their roles in this image is what makes it work. As a model being photographed, the mother wears a glamorous all black outfit, and two gaudy purses more likely to be found on a woman at least half her age. She affects an almost contemptous look, while the father, an art director, sports a bowler hat, a ludicrous shawl of some sort, and a posture that suggests, “I’m thinking very deeply about what’s going on here.” Throughout the work, the audience finds the family wearing silly outfits, or pretending to be something they’re obviously not. This reveals the person to the audience—the mother’s come-hither pose communicates something tangible about her ability to take herself seriously. Depending on the situation, there can be genuine feelings of humor, warmth, or seriousness in the way that the subject approaches their role. This feeling breaks through the artificial conceit of the scene. 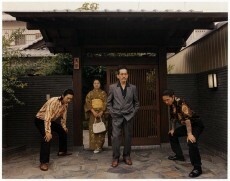 Asada’s work makes it easy for the audience to establish a relationship with his family. Although the scenes are obviously staged—and there can only be an initial, fleeting doubt about this—they play a small but useful trick on the audience. In an uncanny way, it’s as if the audience already knows them from the beginning: here are the farmers you see when you visit your grandma in the countryside, here are the drunk office workers you see around midnight, here is the staff at your local ramen shop. Taking an American audience, for example, scenes at a drive-through fast food restaurant, a high school football game, or the parking lot of a big box retailer could produce the same effect. 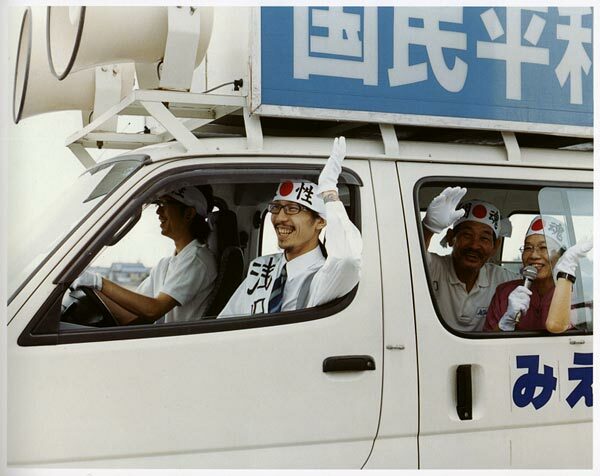 Even if you don’t love those things, they would be immediately recognizable in the way that a white political campaign van will be recognizable to anyone who lives in Japan. Asada effectively removes a barrier to identification with his subjects by placing them in these situations. The charm of “Asadake” is that it seems as though everyone could be about to break into laughter. 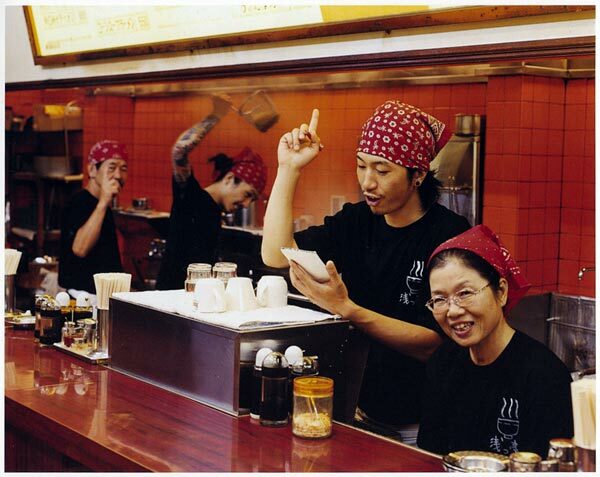 This is actually the case in the ramen shop photo, where the mother gives the camera a sly grin, but it’s even more pronounced in the political campaign van photo, where everyone is cracking up. Each person shows the role they are playing, but they show themselves as well. It’s not a surprise that this image got quite a lot of attention at the gallery, where people would come up to it and share in the absurdly joyous moment. 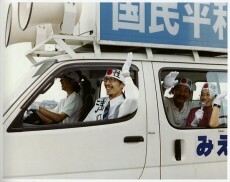 The audience at the Konica Minolta exhibition was certainly in tune with the humor running through Asadake. Almost without fail, people walking into the gallery would stop for a few seconds, figure out what was going on, and then laugh all the way through the series. The feeling of walking through an exhibition where most people were laughing, gesturing at a photo, or calling a friend over to see something outrageous was certainly much different than most photography exhibits I’ve seen. In such an atmosphere, it was hard to not feel close to the subjects of the work. I haven’t ever heard of such a thing, but the exhibit felt like a getting-to-know-you party for the Asadas. You can purchase a copy of Asadake (The Asadas) in the Japan Exposures Bookstore. 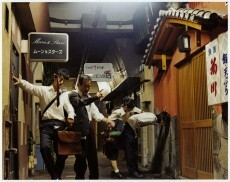 Dan Abbe lives in Tokyo and writes a blog about photography called Street Level Japan. The Asada camera of choice is a Pentax 67TTL. All camera nerdiness aside, I wonder how well this series could play outside of Japan? I was just thinking about that myself. To take the images in this post, the white van image probably wouldn’t have the same resonance abroad. But isn’t it pretty easy to “get” the yakuza one? Or the fashion shoot one? There plenty of others in the book that don’t require any special knowledge of Japan to be grasped – Asadas as bakers, as auto mechanics, as firefighters and so on. You’d definitely have to know the conceit of the series for it to be effective, but I think the humor should be transmittable to an audience outside of Japan. In the end I think that the seemingly utter lack of Snark or Irony in Japanese society allows this kind of sweet work to be taken seriously- it’s like the variety TV shows on in the evenings- everyone’s just having a great old time together. It’s nice to see this kind of approach to photography get some recognition (although the Kimura award was a bit much…). Ah, see, you went a level deeper than me there – I understood it was a principal’s speech but did not realize it was for sports day! I still enjoyed it, of course, even in my ignorance, and I feel confident that audiences could get something out of these photos without understanding all of the Japanese cultural references. That’s a great point. Could I be more likely to respond positively to this work because of my callous American upbringing? >>That’s a great point. Could I be more likely to respond positively to this work because of my callous American upbringing? That’s a great point. Could I be more likely to respond negatively　to this work because of my callous American upbringing? No not at all! I’m wondering if I would be more sensitive to the sincerity of this work, by contrast as it were. Even looking at the first print, I couldn’t process the image properly. Why was it so big? 2. Very Big Prints are associated with Very High Prices. Sound business decision there. It’s nice to see this kind of approach to photography get some recognition (although the Kimura award was a bit much…). The official rumor is that ERIC, Suzuki Shin, and the Asada family were all about evenly in the running for the Ihee prize- and apparently when it came down to it the determining factor was who had the highest number of books sold. Hey, “a little bird” whoever you are….isn’t “official rumor” an oxymoron? 🙂 Be that as it may, always love a good rumor! As for the question of how this series plays abroad, I can’t help but feel that, like say Tomoko Sawada’s work, it’s the kind of work curators and blurb writers feel the necessity to contextualize for a non-Japanese audience. Not saying that’s a necessarily bad thing or a knock on the work, but it is an interesting question. Given the global currency that “Japanese photography” has these days (yes, this site itself is (a small) part of that), I wonder if photographers are increasingly conscious of how their work plays abroad and whether the work will get tailored somehow to be “readable” at home and abroad. But Kurt, I’m not whining. If Asada and the others keep people happy, that’s fine with me. Meanwhile, I guess the reason why the Wikipedia page on Kurata is relatively sparse is the same reason that the Wikipedia page on just about every photographer is sparse: few people want to spare the time and energy needed to hunt for reliable sources from which to write these people up. Any reader of this site is of course welcome to add stuff from reliable sources about Kurata’s post-1999 exhibitions (a very quick bit of googling mostly brings the expected mentions in blogs; these wouldn’t be usable), or improve articles that are even worse (e.g. that on Fukase, and there are dozens if not hundreds like it), or to write articles on people who have none (and there are even Magnum photographers with no articles). Back to more or less present-day Japan (aside from its old geezers). Slowly Down the River does look interesting; it’s on my “to look for” list. Certainly good new work is still coming out, even though the publishers are hurting.